An exceptional villa, sleeps up to 20, includes mini-bus with driver and chef. Villa Sanyanga is one of the most popular luxury rental villas on Phuket Island. It is a “home from home” family friendly villa, with five star service. Our chef Lily has been praised in more than 170 TripAdvisor reviews over eight years. She not only produces the most amazing delicious meals, but also manages the villa, and takes care of our guests, ensuring they have a holiday of a lifetime. You will feel pampered and relaxed, enjoying the spectacular ocean views from the villa, while our chef prepares all your meals, our staff clean the villa, and your driver awaits your request to take you anywhere you would like to go. 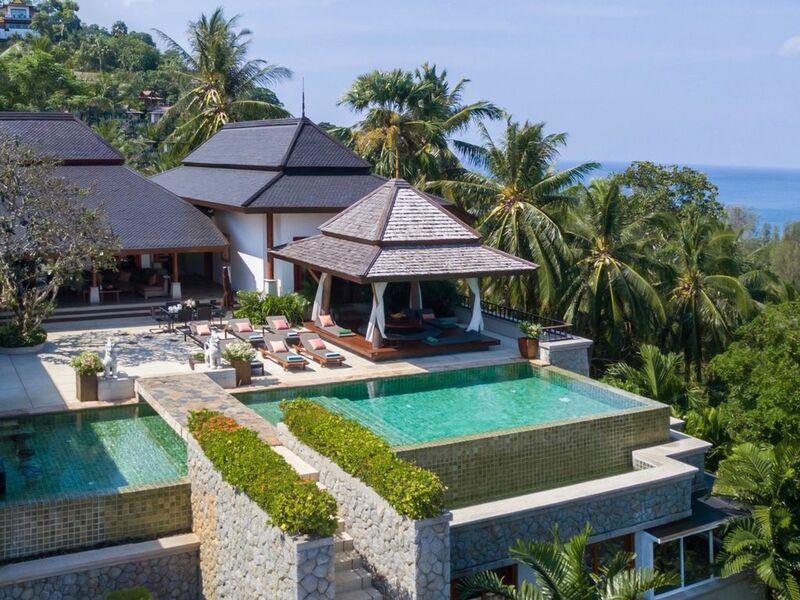 Villa Sanyanga is a seven bedroom, seven bathroom villa in an exclusive private residential development on the hill above Surin beach, on the north-west coast of Phuket, Thailand. There are fabulous panoramic sea views over the Andaman sea, and Bangtao Bay. Our services include a full time private chef, maids, handyman and driver. The minibus can seat up to 12 people plus the driver. There is a beautiful private infinity pool, and several outdoor dining areas, a typical Thai Sala by the pool, with revolving table, and sun loungers. The villa can comfortably accommodate up to 20 adults and children in luxurious, fully air-conditioned surroundings. It is two minutes drive from Surin beach, as well as close to many restaurants and shops, and 15 minutes from the Laguna golf-course. Villa Sanyanga has 5 staff, comprising a private chef, who is also our villa manager, an experienced lady mini-bus driver who will also act as your guide in Phuket showing you where to go and what to see, two maids and a maintenance man. Jone the driver/ guide speaks English and Cantonese, as well as Thai So does our chef Lily who will prepare and cook your meals - you only have to shop for the groceries, or she will do this for you - there is a Tesco supermarket 5 minutes from the villa, or Lily can shop for you at the local markets if you prefer. Airport transfers on arrival and departure are free. (one on arrival and one on departure) A 13 seat mini-bus with driver is provided for the rest of your stay. Baby-sitting can be arranged, as well as in villa Thai massage. Fast Wifi internet free on all levels of the villa. Included in your rental price there is also a 12 seat minibus with a trilingual lady driver, on hand permenantly during your holiday. She will drive you everywhere and give advice on where to go and what to see in Phuket. For large groups, 16 or more, we may need to hire extra staff for catering, if you are planning to eat all or most of your meals in the villa. This will cost only 1000 baht a day between everyone for temporary staff, which you give to our manager so she can employ someone for kitchen help. For groups to 20 or more, we need two extra staff, so that would be 2000 baht a day, paid between everyone staying in the villa (so 100 baht a day per person which is about US$3 or £2). The area: Villa Sanyanga is located in a prestige area of Phuket, in a very exclusive and private residential complex. Though peaceful and secluded, it is only minutes away from Surin Beach, well known for it's beautiful white sand and clear water. Our driver could take you to Bang Tao Beach too, only 10 minutes away. It's the beautfiul 7 kilometre long beach which you see from Villa Sanyanga's pool terrace. On the southern end there are long-tail boats for hire, and some beachside restaurants. The central part has some very high end resorts tucked back in the trees, in the Laguna area. The northern end, known as Layan Beach, is quiet and undeveloped, as this is a national park. Other nearby beaches are Laem Singh beach and Kamala beach, all within minutes of the villa. There is also the famous Phuket Fantasea show nearby, and many golf courses within easy reach, not to mention large shopping centres, and typical local markets. The weekend market in Phuket town should not be missed. Children very welcome. : This villa is perfect for large families, or groups of friends, and is ideal for children. The swimming pool has a protective fence which can be erected on request, and the large family room has a flat screen TV, with English satellite programmes and a large selection of children's DVDs and toys. as well as Netflix. We have baby equipment too, such as 3 high chairs and 3 cots, and 2 car seats. Lily, our chef and manager will look after you well, and ensure your holiday runs smoothly. She'll give you advice on local attractions, and help if you have any problems. She and the other staff will go out of their way to ensure you have a holiday to remember. She will organise in-house massage for you or baby-sitting. In addition to this she will treat you to her wonderful cooking, and even teach you how to make her dishes if you wish. She used to teach Thai cooking in Hong Kong, and speaks Cantonese as well as English and Thai. Transport and Yacht: The driver of your mini-bus can act as a guide, and show you the best places for shopping, or take you to any of the wonderful beach restaurants we recommend. We have four luxury power catamarans which sail off the East coast of Phuket. We offer our villa guests a discount on a full day cruise on the yachts. This will give you an unforgettable day, sailing amongst tropical islands, swimming, snorkelling or kayaking, having fun on the boat slides or water-bikes, or just relaxing in the floating jacuzzies in the water. Ask for information about the yacht, and for both the yacht and villa websites. If this villa is booked for the time you want, please enquire, because I also let other villas close by, for friends. This is also useful if you have a very large group and want 2 or 3 villas close together. As we are often heavily booked, don't hesitate to ask if your dates do not quite fit our availability. We have a very nice reasonably priced guesthouse near the villa where you can spend one or two nights or so, if your dates do not fit our availability. Also many good hotels very close by, near Surin Beach and Bangtao beach. Please see our more than 170 reviews over the last eight years on trip advisor. My name is Jacquie Pinnell, and my brother Richard is the owner of Villa Sanyanga, and Tiger Marine Charter, which operates many boats for cruises off Phuket. We offer Shashani a 43ft catamaran and Sanyati, a 51ft catamaran at discounted rates for villa guests on day cruises. Also a speedboat Shashi which can take up to 10 people. Richard lives in Thailand and is a retired Captain with Cathay Pacific Airways. He runs Tigermarine Charter company in Phuket. I let the villa on his behalf. We grew up in England and Zimbabwe, and now he lives in Asia, and I live in Spain and France. With skype and emails we work closely together, and with Lily our Villa manager too, and are in constant contact with the letting of the villa and chartering the yachts. Richard lives in Phuket with his wife and sons, and lived in Villa Sanyanga for several years, before moving to the East coast, closer to the boys' school and to the marina where the yacht Shangani is moored. The most fabulous thing about this villa, in my opinion, is the breath-taking view from the pool terrace, over the whole of Bangtao bay. But what makes it wonderful for holiday rentals is that it can take very large groups. Perhaps a family reunion for extended families spread out over many countries, or a group of friends celebrating a birthday. There is so much space and privacy in this beautiful villa. For instance, the garden level area alone can sleep 7 people, with lots of space, and is ideal when several different families renting the villa. Our biggest feature though, that sets us apart from other villas, is our five star service and fantastic staff. They are all exceptional people, and will do everything in their power to make sure you have a stress free holiday of a lifetime. All the reviews we have ever had, stress how wonderful our staff our and what great service we offer. toilet, shower, Lovely garden spa room with massage bench. The bathrooms are all exceptionally beautiful, with two hand basins, very large shower cubicles, and either baths or jacuzzi. There is a small shower room and toilet in the guest cottage which is the seventh bedroom) There is also an outdoor shower on the pool terrace, and a separate toilet on the pool terrace. All bedlinen and towels are provided, and laundered by our staff or a laundry company.. There is a washing machine for use of guests, or Lily will take your washing to the local launderette and return it the next day. Sheets and towels are of course laundered by the staff. Plenty of parking, as the villa is at the end of a cul de sac. No passing traffic. Free wifi on every level of the villa, the fastest available in Phuket. We provide bath towels, hand towels, pool towels and beach towels. Free high speed, unlimited wifi on all levels of the villa with extra modems and boosters. A large living room with plenty of seating, beautiful artworks, and a huge TV screen, which shows Netflix. We have a dishwasher, but you will NEVER need to wash any dishes, we have staff who will do this for you. We have several refrigerators and freezers, as well as in ice machine. Large hob. Our chef produces beautiful meals here, no need for you to go near the kitchen, unless you want to. Lily will give you thai cooking lessons if you like. She is an experienced teacher. Makes fresh coffee each time from ground coffee beans. There is a large solid wood dining table which seats up to 20. Also another table for 12 outdoors on the shady terrace. In addition there is a sunken revolving table in the sala which can seat 8. 4 large flat screen TVs, set up with Netflix, and also receive satellite channels. Plenty of inflatable toys for the children in the pool. Large pool terrace with many shady areas, and lots of sun beds and places to relax. Smoking strictly not allowed indoors, but allowed outside. Every bedroom has an outdoor area, so this is not a problem, and most of the time you will be living outdoors. Beautiful infinity pool with stunning views to the west and north. First time visitor to Phuket Thailand and my experience at Villa Sanyanga was outstanding. The amenities at the Villa were as advertised and exceptional. The staff at the Villa were pleasant, attentive and responsive to all of our requests. The manager (Lily) made you feel like family and at home at Villa Sanyanga. I would highly recommend this place to anyone seeking a first class experience. Thank you so much for this review, and l am happy that you all enjoyed your first visit to Thailand in Villa Sanyanga. Lily joins me in thanking you, as do the rest of the villa staff, and we send our best wishes to you and your friends. Hope to see you back here one day in the future. I often wonder if the pictures on the website is how it really looks in real life, quite often you get to a place and are disappointed. I can confirm that the pictures as exactly what it is like, in fact, they don't really do the place justice. The best part is not the villa but the staff, they treat you like royalty and will make sure the only finger you need to life is the ones around your wine glass. Can't recommend this place (or the staff) enough. Great home. Great location. Great staff. Couldn’t have been better! Thank you for a wonderful stay! "We have LOVED it here!!! Amazing. You have a superstar staff here. Everything has been impeccable. The food has been to die for. Jone has gone above and beyond in helping with some of our things. We’ll leave a review then we get home. Truly has been the trip of a lifetime." Having read other guests' reviews we were confident that we would have a great holiday in the house, but what we failed to appreciate was just how amazing the staff were. The food created by Lily was better than any restaurant we had been to in Thailand! Nothing was too much trouble for the staff who did everything to ensure we had a brilliant holiday. Thank you so much for this lovely review! I get worried sometimes, that with all the glowing reviews we have, that expectations will be too high, and people might be disappointed, like going to see a film that everyone else has raved about! So I am very glad to hear that your expectations were met and even exceeded. We are very lucky to have such loyal and hard´working staff in Villa Sanyanga, and they all go out of their way to look after our guests. And I know Lily's cooking is hard to beat!! From my initial communication with Jacquille my experience was first class. We travel internationally multiple times a year and Sanyanga was Amazing from our pick up from the airport by Joan to our departure. Lily is the BEST!!! The house is great and the staff is what makes this a class act. We were treated like royalty. We had the opportunity to use the Yacht and it was a trip of a lifetime. Again the staff is first class and attends to your every need. We hope to come back to Phuket specifically to spend time with Lily and the staff and enjoy a relaxing holiday. She gave us many cooking lessons and we never went out to eat as we LOVED our daily prepared meals. Thank you for the opportunity. EXCELLENT IN EVERY WAY. Thank you so much for this lovely review. Lily and the rest of the staff will be very happy to see this. They enjoyed having you in the villa. They do go "above and beyond" for our villa guests, and we are really lucky to have such good and loyal staff in the villa. I am also pleased you enjoyed the yacht cruise - though I am not surprised, it would be very hard not to have a wonderful time on these fabulous cruises! I brought a photo and video crew from the US for a 10 day 'work plus' production to Phuket. We stayed at Villa Sanyanga and through their love and care we all had one of the greatest experiences of our collective lives. The chef and manager Lili is a gourmet chef and believe me that is an understatement. My brother-in-law lives in Bangkok and joined us at the villa, he assured me that there is no better Thai food in Thailand than what comes from Lily's kitchen. Every meal was spectacular and when asked Lili was happy to give us a cooking class (for 15 people!) so we could learn to cook our favorite dishes. She is a treasure and will be a very big reason why I return to Phuket. Her staff is fantastic and catered to our every need and ours were a bit more than the average travelers but that didn't phase them one bit. The driver Jone is a wonderful human being and tolerated our constant requests, we literally saw 80% of the island in Jone's van and she never lost her big smile. She helped my whole team feel safe and welcomed every time she opened the door. As for the Villa itself, you have to see it to believe it. The photos are gorgeous but can not do it justice. To walk out of one of the gorgeous, separate locking entrances to the common dining room, every day...and see that gorgeous view was awe inspiring every single day. The suites are all gorgeous, the villa layout is perfect and the common areas are warm and inviting. We Also chartered a boat from the Villa, a celebration of sorts for 20,people and none of us could believe how amazing it was. The crew plotted an amazing day for us including a fabulous clear water snorkeling spot, a gourmet lunch aboard this stunning power catamaran and then a breathtaking cruise to a unique little bar...on a rock..in the middle of the Andaman Sea. It all sounds to good to be true...and that's exactly what we thought as we enjoyed this life changing experience. If you are planning to visit Phuket, if you're thinking about it, think no further. Gather your friends, buy your tickets and stay at Villa Sanyanga. I've never experienced it's equal and I will be back for more because of it. I'm only on the plane back now and I miss it...and especially Lili already. Wow! This is a really fabulous review Justin! Thank you so much. I am very happy that you all enjoyed your stay at Villa Sanyanga so much. I know that Lily and her staff enjoyed having you and your film crew to stay there, and I am so glad that the weather held for your whole 10 day stay, and enabled your filming to go ahead without problems. Jone also enjoyed taking you around to all the different locations. We all really appreciate your very kind words, and hope that one day we can welcome you back to Villa Sanyanga again. This large luxurious villa is in the exclusive estate of Baan Thai Surin Hill, and is surrounded by a coconut palm grove, overlooking Surin Beach, with breathtaking views over Bang Tao beach and bay. It is 2 minutes drive from Surin Beach with many other beaches within a short drive, and the nearest golf course is 15 minutes away. There is a good supermarket only 5 minutes away, as well as many different restaurants nearby, from well known and luxury, to cheap and cheerful (and delicious!). The upmarket Plaza shopping centre is right by the entrance to the estate, with many boutiques selling clothes and artefacts. There is a wine shop at the entrance too. Golf: 10 minutes from the famous Laguna Phuket golf course, with many other courses within 30 minutes drive. IMPORTANT PLEASE NOTE. THESE PRICES ARE FOR UP TO 14 GUESTS. Add US$50 per night for each extra adult, and $25 PER CHILD UNDER 12, free for under twos. Note the inclusions in our price. Other villas do not include transport which would cost 100 USD a day. The price includes a private full time chef, 3 cleaning staff, free welcome meal, 12 seat mini-bus with lady driver/guide for your use throughout your holiday, airport transfers, and all taxes. Groceries are charged at cost price, no mark up.